Although they no longer hold territory, ISIS sleeper cells were believed to be hiding out in vast deserts and scraggy mountains like Hamreen, from where they have conducted deadly hit-and-run attacks against government posts. CTS spokesman Sabah al-Naaman said the operation had lasted four days, with troops parachuting in and setting fire to 15 ISIS shelters. Among them was a center used to produce ISIS’s weekly propaganda magazine Al-Naba. “A special team is currently analyzing the seized computers and documents — and we’ll see if there’s a new issue, as they are usually published on Thursdays,” Naaman said. 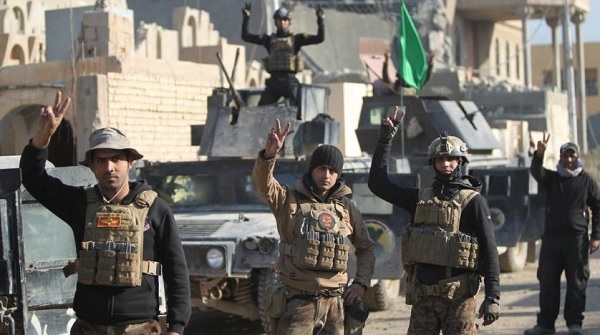 “The important part of this operation is that this difficult area, which posed a threat to northern Diyala and southern Kirkuk, has been cleared out,” Naaman added. ISIS swept across swathes of Iraq and Syria in 2014. But it lost its territorial hold on Iraq in late 2017, and US-backed forces wrested the last piece of land in neighboring Syria from the militants last month. Still, escapee militants have kept up guerilla attacks, especially in rural areas in the provinces of Salaheddin, Kirkuk, Anbar, Diyala and Nineveh. In Kirkuk, militants have killed a dozen village leaders just in the past six months, according to local officials.